Since their discovery, antimicrobial therapies (AMTs) have played an essential role in the treatment of infections in humans and animals and have significantly improved population health. Many of the improvements in mortality and morbidity that modern medicine has secured are largely based on our ability to prevent and cure infections. The introduction of AMTs has, for example, markedly decreased the burden of infectious diseases (e.g. pneumonia and tuberculosis) and, by preventing hospital-acquired infections, has allowed the introduction of complex medical interventions such as organ transplantations, advanced surgery and care of premature babies. All these applications are now endangered by the increasing spread of microbes that are resistant to antimicrobial medications. Resistance to antimicrobials is a natural phenomenon as old as the development of antimicrobials. However, in more recent years this phenomenon has been amplified and accelerated by a number of factors and modern healthcare rely on AMTs that may become ineffective. 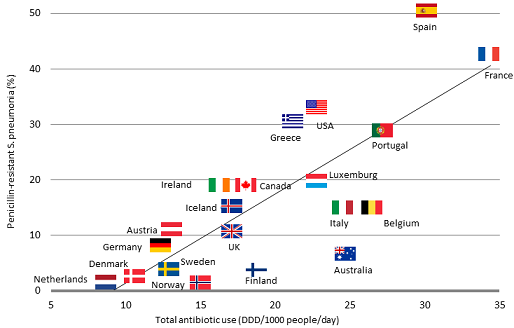 There is a clear association between consumption of antibiotics and the development of antimicrobial-resistant strains of microorganisms (see diagram). The findings presented in the report show that there is a strong case for G7 action in the area of AMR. The G7 has consistently committed itself to tackling global health challenges, including the fight against infectious diseases, and positioned itself as a leading partner in reaching health-related Millennium Development Goals, by initiating and supporting many global instruments of response to threats posed by infectious diseases. The strong political will of G7 countries would offer the opportunity for moving forward in achieving the goals stated both in the 2014 resolution against AMR issued by the World Health Assembly and in the 2012 EC roadmap against AMR. G7 countries, in particular, can create significant added value and change the architecture of the international response to AMR in three main areas: rationalising use of antimicrobials in animals and humans; incentivising research and development of new AMTs; and addressing the potential economic consequences of AMR. G7 countries and the European Commission are deeply committed to fighting AMR. Multilateral and bilateral initiatives as, for instance, the Transatlantic Taskforce on AMR have been at the forefront of efforts to tackle AMR. At the national level, all the G7 countries have developed specific policies to tackle AMR both in the human and animal sector. Note: This report was partially funded by the Federal Ministry of Health (Germany) to support the discussions of G7 Health Ministers on this topic.